Happy Wednesday! I’ve never really been one to paint my nails a whole late – except lately I can’t seem to stop!!! I have been painting my own nails (shocker) every week with fun spring colors and really enjoying having nails that match my outfits and actually look put together. A little bit ago, I did a post on how to fake acrylic nails at home (read it here) but during my busy wedding season, I can’t really have long fake nails. So, I have been trying to keep them painted and professional without acrylics. Enter: my favorite nail polish brands and colors I’ve been wearing all spring long! Let’s dive into this. 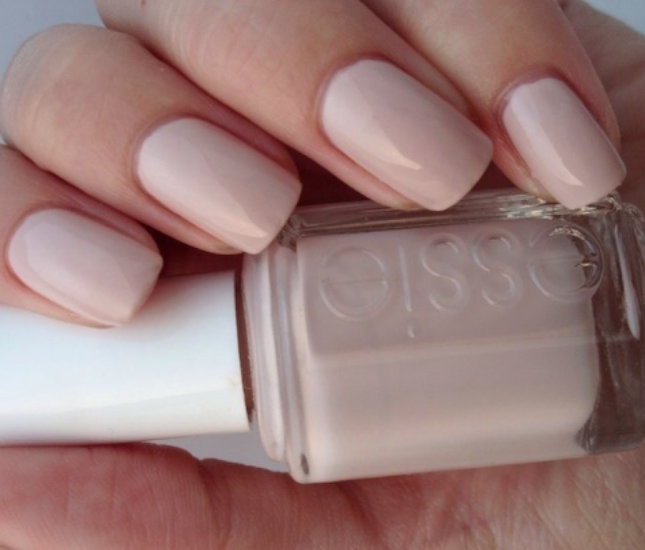 Why Essie is great: I love Essie. This was my first “expensive” nail polish brand (meaning more than $3 a bottle). It has a very thin formula, which means it dried quickly and the layers don’t pile on top of each other. I find that MOST colors are very opaque, which is great because the more opaque the formula, the less layers you need to use and the less chance you will chip or smudge your polish. They have a HUGE variety of colors. 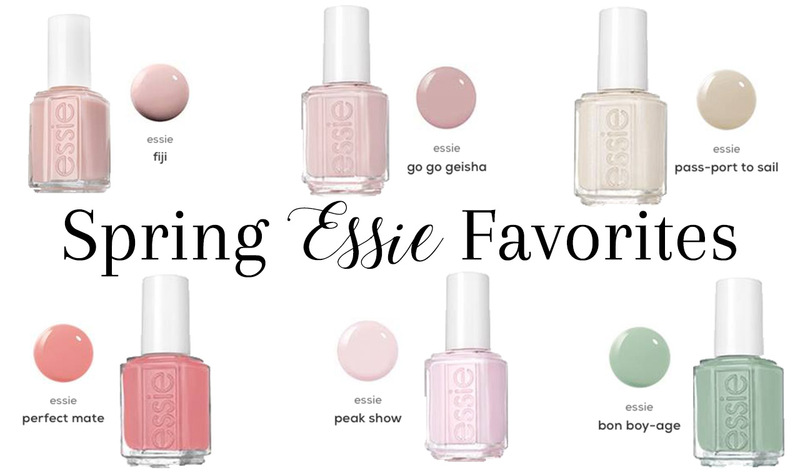 Which colors I LOVE for spring: Fiji, Pass Port-To-Sail, Bon Boy-Age, Perfect Mate, Go-Go Geisha, Spool Me Over, and Peak Show. Why O.P.I. is great: O.P.I. is like one of the OG nail polish brands. My mom has had this brand forever growing up, I used to get it a lot when I’d get manicures with my grandma as a kid. I remember when I had a birthday party (or went to a birthday party? now I can’t remember) in elementary school, I got this BEAUTIFUL opal iridescent O.P.I. color. I wish I could find it today! But it’s honestly just a tried and true nail polish with endless color options and fabulous payoff. They now have their infinite shine collection which I am obsessed with. Why ZOYA is great: I honestly didn’t expect to love ZOYA as much as I did. They’re a newer brand to my collection but they have one of the best nail polish brushes EVER. It’s so wide and flat so you can get the whole nail in one stroke. It’s GENIUS. It’s so much better than trying to brush a million strokes on your nail before it dries. It almost eliminates the chance of streaking some colors are prone to. Why KL Polish is great: First of all, KL Polish is owned by one of my all-time favorite youtube beauty guru Kathleen Lights! She is FABULOUS and so I am always looking to support my fellow girl bosses. I honestly didn’t expect it to be so amazing but it honestly is. I am SO impressed with the lasting power. I can get up to 9 days in this polish which is so unheard of for me. Which colors I LOVE for spring: The entire Ethereal Garden limited edition boxed set!!! Colors – Pinky, Gum Would Be Perfection, Dream Boy, Charmed, Miss Kensington, and Selene. 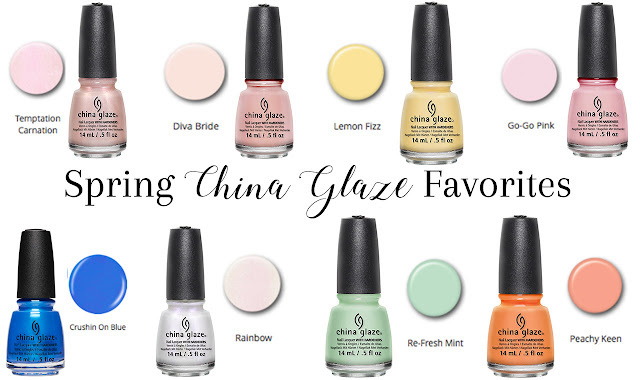 Why China Glaze is great: This is a polish I would use frequently when I would get my nails done at the salon. I only recently decided to look into it myself and see if I could purchase it outside of a salon setting. You totally can and it totally rocks. This has a nice brush too, and the colors last almost as long as KL Polish!! They have a fabulous color selection. Which colors I LOVE for spring: Crushin’ On Blue, Temptation Carnation, Rainbow, Diva Bride, Go-Go Pink, Peachy Keen, Refresh Mint, and Lemon Fizz. These colors are SO cute. I trust these brands so much and it just honestly takes practice when painting your own nails to get good at it. It’s taken me a long time to be able to get my left hand to look as good as my right, but now I can paint both hands no problem! A few months of constant practice really built my skill up. Do YOU like to paint your nails at home? What are your favorite brands and colors? Let me know in the comments below! I've never been big on doing my own nails but there's something undeniably stunning about a fresh coat. I am looking forward to the pastels and nudes of this season and just might bite the bullet and get my own done after all. Thanks for the inspo!